Thursday, 9/27/12 - My new CuteZCute cutter had just arrived the day before, so even though I didn't neeeed to pack a cute lunch, I did anyway! Since I had wanted to include one of her Chobani Champions Greek yogurt cups, I chose my *cough* I mean her new Yubo box. The cups fit nicely inside, and the box has an ice pack designed to stay inside to keep everything fresh and cool. Fruit Cup: The blackberries came from our backyard a mysteriously close overgrown thicket nearby, and the raspberries and strawberry came from the organic CSA farm we go to. I also got her to start enjoying some granola with her yogurt. Sometimes mixed in, but often just munched alongside. I got these cute little butterfly boxes at Easter, as an egg hunt alternative. Well, that's what they were made for anyway. *I* got them for bento! This one was the perfect size for some granola! Hello, Kitty! : Since she had started hyperventilating over the kitty cutter, I decided to make her first lunch using it. She even chose it over the new Hello Kitty gear that had arrived from Japan that same day! I used the head cutter to make two bread heads, cut some ham heads, and a cheese head. Since my cheese brick is narrower than the bread, I had to use two slices to fit across. I used the kitty face cutter to punch features out of the top slice of bread, then used it to cut the same bits out of the cheese scraps, which I used to fill in the holes in the bread. I got that idea from seeing Bento For Kidlet's Soft Kitty lunch. I cut some green beans into "grass" for the kitty, and put some Ranch to dip in a pink heart box. I had been eyeballing these Yubo boxes for quite a while now, but couldn't justify the expense, especially as we were so happy with our EasyLunchboxes. But Diapers.com had the Fairy Princess style on clearance for around $22, and I had a "Pay $10, Get $20" Plum District deal for Diapers.com! Woot! That knocked it down to only $12! I couldn't not get it at that price! I tacked on some other clearance and sale items (like my Boon Mush) to hit the minimum order for free shipping. I like that the inner containers are leak-resistant. LOVE the interchangeable faceplates! 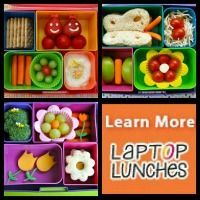 This allows you to have a more attractive and personal lunchbox that grows with your child. As their tastes change, so can the graphics! They are all really beautifully done designs; attractive and colorful and appealing. Different sized inner containers allow for packing versatility. There are three sizes of containers that fit in the six "segments": the small circle (1 segment,) a medium oval (2 segments,) and the large square (4 segments.) 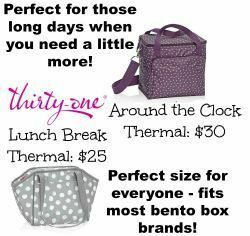 If you buy enough extras (available separately,) you could even pack them up in advance and have a whole week's worth of lunches done at once. Everything (except the removable faceplates) is dishwasher safe! The ice pack melts pretty quickly, and the box isn't really insulated. 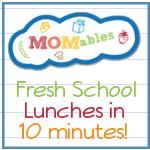 Works fine to keep meats and cheeses fresh for lunchtime, but not as good as keeping them fresh enough to finish off any leftovers after school. More flipping bits to keep track of! Hubby has done several loads of dishes since I made this, and I've only found one of the four container parts so far! 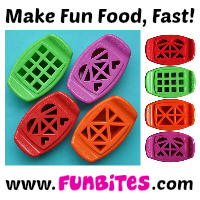 It is carried upright instead of flat, so all my cute food would get jumbled up! I'd have to get really good about gluing things to the box with PB (or a non-nut butter,) or stuff napkins in there or something. I don't know if my 4-year-old can open the box. The entire "face" comes off, which took me several frustrating minutes to figure out at first, since there were no instructions on the tag. She hadn't really wanted to try, and I haven't pushed it. Ditto on the inner containers. Not sure if she could open them herself yet. I did discover, however, that she can open the yogurt foil by herself. Huzzah! Find the entire line at www.getyubo.com. She loved not only the box, but also the lunch. She ate everything except the fruit. Meanwhile, Baby had some Kashi Warm Cinnamon Oat Cereal "crunchies" as her little after-bottle snackerel. Heart box and BPA-free spoon are from Dollar Tree. The box came in a 10-pack around Valentine's Day, and the spoons are available in the baby section. I was on their site last night, contemplating a purchase of a Yubo (those faceplates are just adorable).... so glad you posted this review. It helps my decision! So pretty! Sprout chose the same Faceplate set for after Halloween!